1 How is WebRTC different from Discord, Google Hangouts, Skype, etc? How is WebRTC different from Discord, Google Hangouts, Skype, etc? WebRTC is a HTML5 technology that runs video and voice through a web browser without the need of a java applet. Applications like Skype or Discord aren't browser-based and therefore have access to hardware acceleration and data compression that Roll20 cannot take advantage of. Those applications use a Client/Server or All-to-One-to-All connection rather than a Peer-to-Peer connection. With an "All-to-One-to-All" connection, applications like Skype send your video/voice data one time to their server which then carries that load of data to each of the other people in the call. With "Peer-to-Peer", you are sending your video/voice data again to each peer connection in the call. This means that the upload bandwidth cost for a WebRTC call is higher than other VOIP options in anything more than a two person call. This higher upload bandwidth cost can result in stability problems for users with low upload bandwidth connections. Roll20 WebRTC can only be used in web browsers that natively support it. 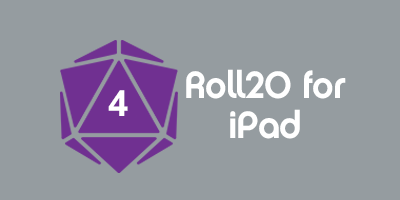 Roll20's officially supported browsers, Chrome and Firefox, are both compatible. A Roll20 WebRTC call has a suggested download and upload bandwidth of 512Kbps per additional user in the chat. That means that in a six person call (five users other than yourself), you would need around 2.5Mbps of bandwidth for a stable call. If your group has members whose connections cannot support these requirements we suggest using a 3rd party, non-browser based chat option, that can make use of both hardware acceleration and data-compression to lower bandwidth requirements. If you or your players are experiencing issues with video and voice, the first thing everyone should check is the Video + Audio Chat Options under the My Settings tab of the Sidebar. The GM should have Chat Tech either set to Roll20 WebRTC (Chrome + Firefox) or Legacy Roll20 WebRTC(deprecated) selected in order for WebRTC to activate. If Chat Tech is set to None (no audio/no video) a WebRTC call will not initiate call connections between players. If you are still using the Legacy Roll20 WebRTC(deprecated) option and are still suffering audio and video problems, we recommend swapping over to the more modern Roll20 WebRTC (Chrome + Firefox) option. Everyone (GM and Players) should check their settings for I want to broadcast to others as well as I want to receive from others to see if video and/or voice has been unintentionally disabled here. Check that the correct devices are being used for video and voice. Audio Output Source selects the speaker device you wish to hear voice with. Audio Input Source selects the microphone device you wish to speak with. Video Input Source selects the webcam you wish to capture video with. Note that the Audio Output Source drop-down menu is not available unless an a call is already active. Always click on the Reconnect Button if you make any device input/output or broadcast/receive settings. Beyond that, often if a video or voice problem occurs, hitting the Reconnect button can often fix a broken connection that failed silently in a call. At present, Roll20 only fully supports Firefox and Chrome web browsers for our VTT. Other browsers may be able to handle WebRTC with little to no issues, but we can't devote reliable tech support for them if you do run into any issues. It's generally a good idea to keep your browser updated to take advantage of browser bug fixes and optimization measures. Click on the More Button (vertical row of three dots icon) in the upper right hand corner. Click on the Help option from the resulting drop down menu. Click on About Google Chrome option from the secondary drop down menu that appears. Paste chrome://settings/help into the URL bar and hit Enter. Either method will open Chrome's "About" page that will inform you of your current browser version and will automatically prompt you to update to the latest stable version if you're not using it. Relaunch your browser when prompted after the install. Click on the Menu Button (three horizontal lines icon) in the upper right hand corner. Click on ? icon at the bottom of the drop down menu. Click on About Firefox from the resulting roll out menu. Firefox will tell you your current browser version and automatically prompt an update to the latest stable version if you're not using it. Click the Restart to Update button if necessary. To protect your privacy, microphone and webcamera permissions are disabled from use on Chrome and Firefox by default. 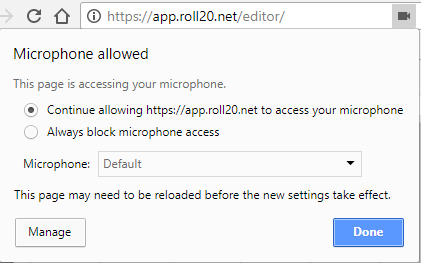 If this is the first time you've used Roll20, recently cleaned out your browser cookies/cache, or working from a fresh install of your browser, you'll need to approve the Roll20 website's use of your camera and microphone for them to be used for broadcasting either video or voice within a game. When the VTT loads for the first time, you should be asked to Allow or Block camera and microphone access from a pop-up that appears at the top of the screen. Click Allow to enable your camera and microphone to be used within a Roll20 game. Click on the camera icon in the far right of the URL/search bar to reveal a drop down menu. 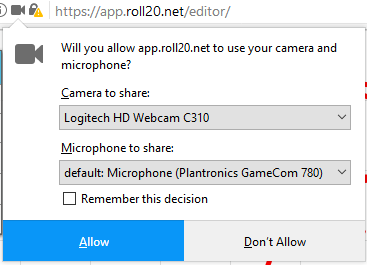 Ensure that both Camera and Microphone options have their permissions set to "Continue allowing https://app.roll20.net to access your [microphone/camera]". Make sure you're currently on Roll20.net when you set this, this setting is URL sensitive. When the VTT loads for the first time, you'll be asked to Allow or Deny Microphone and Camera permissions from a drop down menu in the upper left hand corner of the screen. If not, click on the red Camera or "Microphone" icon in the upper left hand corner of the address bar next to the Back button. Be sure to select the correct Camera and Microphone to share before clicking the Allow button. Click on the Menu Button (three horizontal lines) in the upper right hand corner. Click on More Tools from the dropdown. Click on Clear browsing data from the new options. From the "Time range" drop down select All time option. Check both Cookies and other site data and Cached images and files. Click the Options Button' (gear icon) from the drop down menu. On the Advanced tab, select the Network sub-tab. Under the Cached Web Content section, select the Clear Now button. Check to see if your camera works with Google’s WebRTC demo. Alternatively is to run a test of your webcam and mic through appear.in. This website is also a Peer-to-Peer WebRTC service that can have up to four users in a conference call. Check if your Microphone/Webcam works with a different browser. For instance, if you are using Firefox check if it works with Chrome instead. Does the Microphone/Webcam work with any other software that uses the camera such as Skype or Photobooth. If you don’t already know them, you can take a bandwidth speed test from OOKLA’s Browser-based Speedtest. You will want to run this test in the principle environment you normally play your games on Roll20 and have a Roll20 game currently open. Once speednet's home page loads, click the central "GO" button. Allow the test to run. This process can take a couple minutes to complete. Once it's finished, Speedtest will give you your download and upload rate in megabits per second (Mbps). Let us know what your average Download and Upload speeds from the above Bandwidth Test. This page was last modified on 17 February 2018, at 02:18. This page has been accessed 2,130 times.